JUST ANNOUNCED: The U.S Department of Labor’s Occupational Safety and Health Administration (OSHA) revealed today that it has launched a new Frequently Asked Questions (FAQs) section on their website. 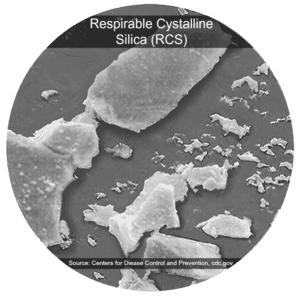 This new feature addresses the Agency’s standard for exposure to respirable crystalline silica in the construction industry. These FAQs were developed by OSHA in cooperation with industry and labor organizations in effort to provide additional guidance to employers and employees regarding the standard’s requirements. In addition to this new page, a series of six new videos are now available which help instruct users on methods for controlling exposure to silica dust when performing common construction tasks or using specific equipment. 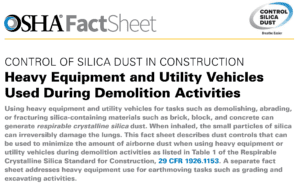 The final ruling was published by OSHA on March 25, 2016, regulating the permissible exposure levels for respirable crystalline silica in the construction industry, as well as other industries involved in silica-generating operations and activities. As enforcement of the new is underway, companies nationwide are working diligently to meet these requirements in effort to avoid potential fines or downtime. Our team have over a decade of experience in helping companies meet and exceed air quality compliance regulations. Understanding the science behind dust suppression is a key factor in developing an effective management strategy. Give us a call today to speak with one of our Dust Management Specialists to learn more about our dust control solutions for construction, demolition and more.